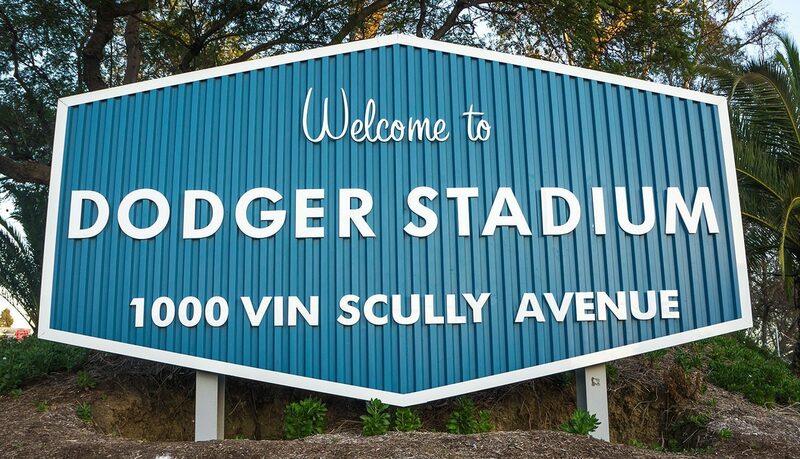 Dodger Stadium has been a beloved landmark in the City of Los Angeles since 1962. 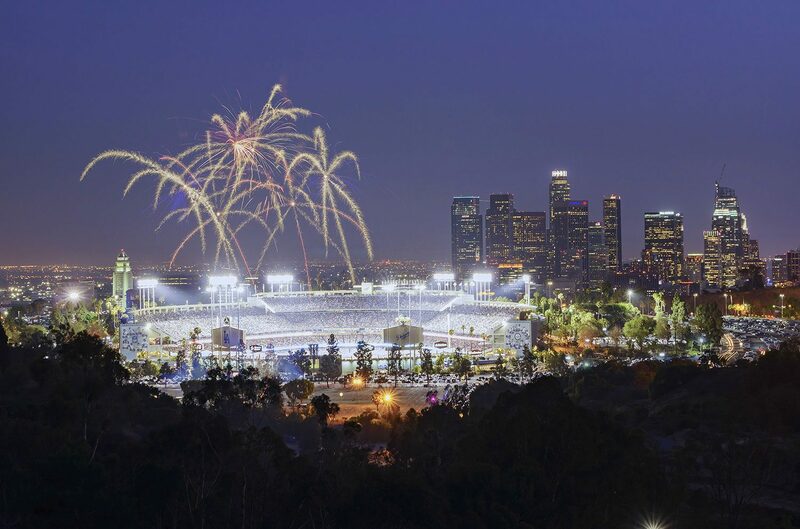 From late 2012 to March 2013, Dodger Stadium underwent a $100M renovation to upgrade the venue and enhance the fan and player experience without losing the aspects that made the ballpark so iconic. 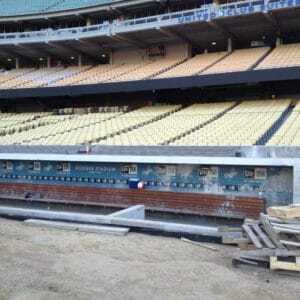 To accomplish this renovation, Dodger owners enlisted feedback from staff, fans, and media. 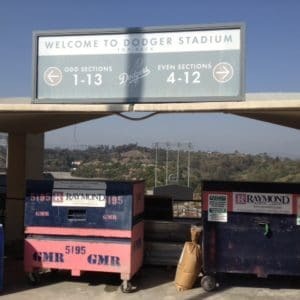 The list of improvements was long and included upgrades to vehicle and pedestrian circulation, renovations and additions to restroom and concession facilities, improvements to the home team clubhouse, new LED scoreboards, a new video control and production facility, baseline advertising panels, and more. 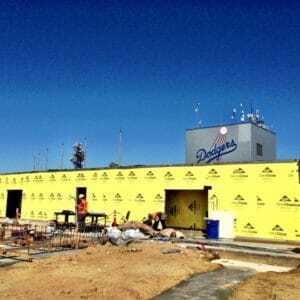 With an end date of “Get Ready for Baseball!” (March 29th, 2013), and a start date near the end of 2012, the roughly four month schedule was embarked upon by General Contractor Hunt Construction Group and its trusted subcontractors and vendors. Approximately one million dollars of renovations were completed per day. Raymond’s scope of work totaled 5.4 million dollars with a schedule of just over 3 months and began with infrastructure improvements which facilitated all phases of the project. This was followed by restroom renovations, which consisted of remodeling and constructing 27 restroom facilities throughout the stadium, and finally the clubhouse. As the project began, additional portions of work were added including the concessions, executive suites, and retail facilities. Throughout the project, Raymond worked hand and hand with Hunt Construction and the architects to help meld design intent with actual conditions. To meet the stadium’s fast approaching deadline, Raymond quickly compiled both a strong office management team and field team (which included personnel from both Raymond’s Southern California and Las Vegas region). By the first week of February, Raymond’s portion of the project was in full swing and firing on all cylinders, with a lot of work still ahead. There was a significant amount of manpower running at all times, including swing shifts, overtime, and weekend work. Raymond started with a two-man crew constructing the infrastructure, which quickly escalated. Around the third week of March, Raymond had a peak of approximately 135 people in the field. 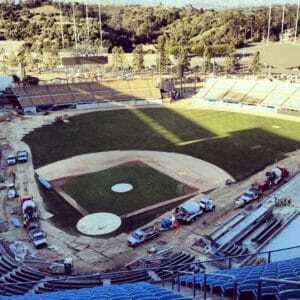 The Dodger Stadium 2012-2013 renovation was a picture of teamwork, craftsmanship, and state-of-the-art technology. The venue was made ready for baseball, just in time, with a new look and feel that both preserved and celebrated its incredible history.